We constantly receive technical questions via email from our aspiring supporters on the inter-webs. Inquiries generally include a vast spectrum of subjects ranging from ‘How do I find the Milky Way’ to ‘how can I safely hike in the middle of the night’? For the majority of those who cannot actively participate in our workshops, we are beginning a series of simple and basic, informational tutorials that may help answer some of the most asked questions we receive. For our first topic, we’re going to address our most popular question: how do I find the Milky Way in my area? Now before we get into the specifics of how to find the Milky Way, please remember that what you observe with the naked eye is completely different than what you see in our photographs. Why is this you ask? 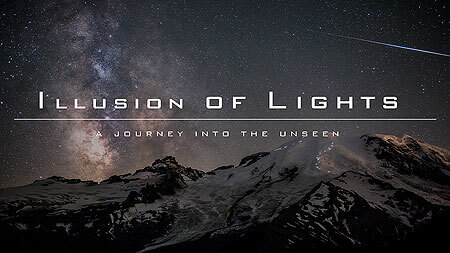 It’s because our cameras are capturing images of the Milky Way with long exposure photography. 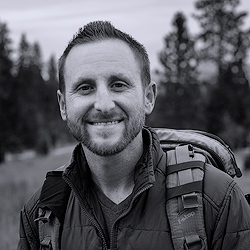 Meaning, the camera’s shutter is open for long periods of time, ranging from 15-35 seconds, absorbing distant light, and converting all that time into a single image. 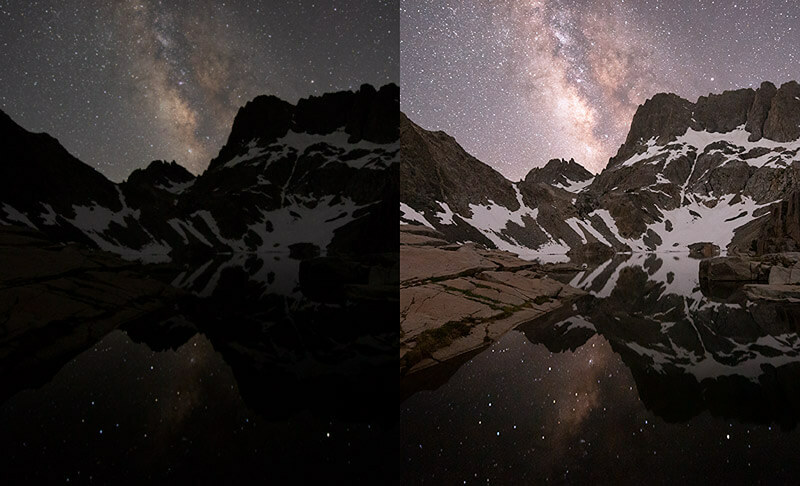 Since our eyes can only see about 1/30 of a second at a time (compared to digital cameras), we are unable to see the Milky Way like the images you see in our work…or can you? The sources above are fairly accurate however; my advice is to use the maps as a basic starting point. For example, you may travel to a certain location, only to find that urban light pollution is reaching farther than the map displays. 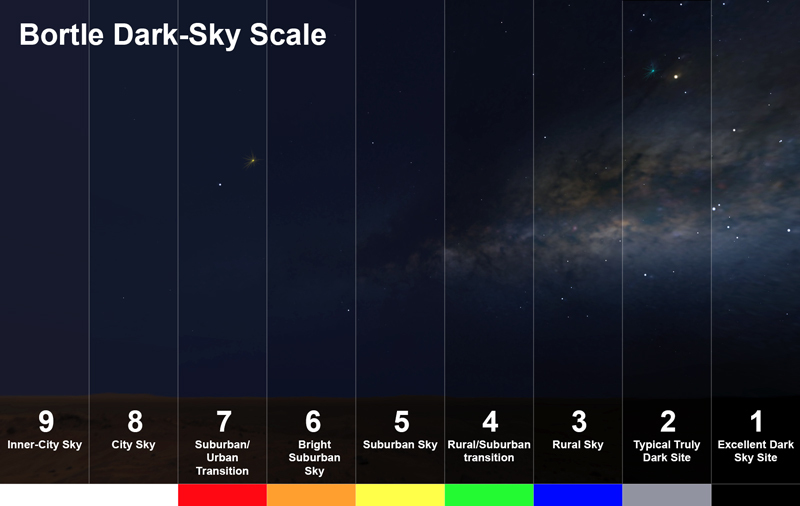 If you’re lucky, the night sky is much darker than you expected (hopefully this will be the case). The next step is to find what phase the moon is currently in. If it’s in the first quarter (half- moon) or brighter, chances are you will not be able to see the Milky Way with a naked eye because there will be too much moonlight outshining the stars. Visit this site to see which phase the moon is currently in: Moon Connection. 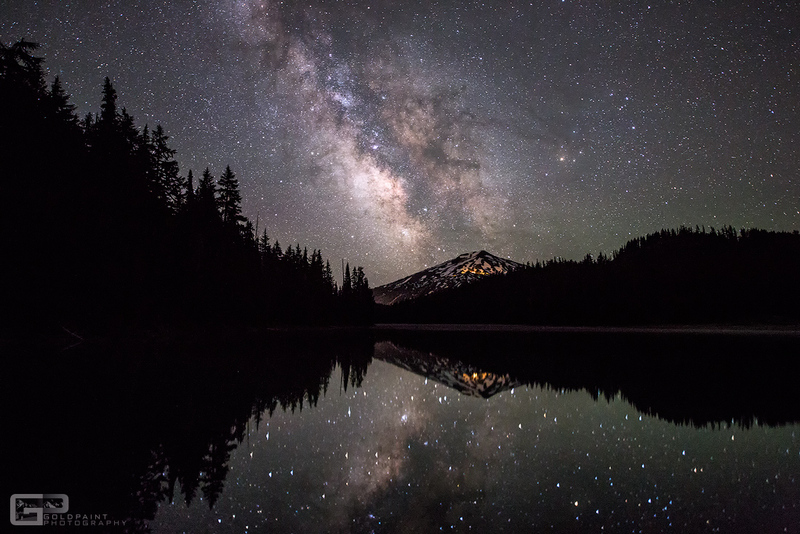 The Milky Way reflects off an alpine lake in the Cascade Range. 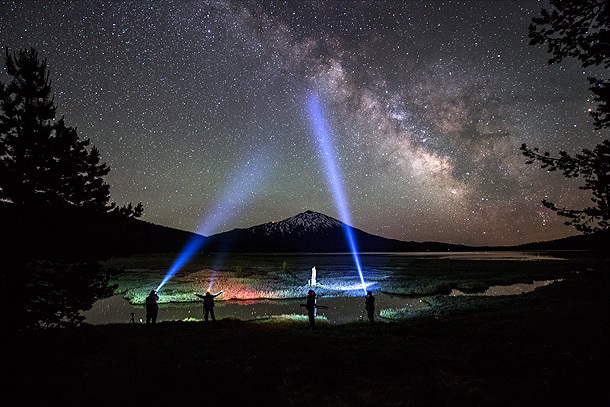 Once you have found a dark location where there is little to no moonlight, it’s time to determine where the Milky Way is located, because different elements of the Milky Way are all around us and at different times throughout the year. 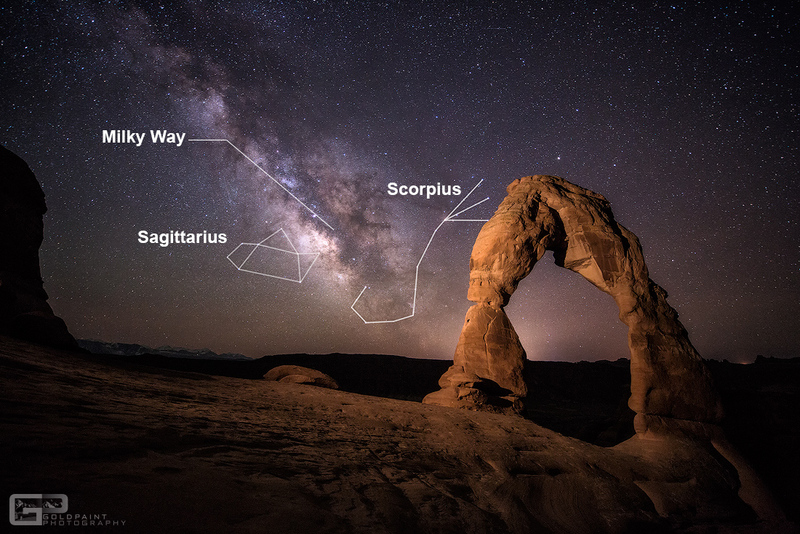 For this tutorial, we’ll cover the ‘core’ of the Milky Way (pictured above). This is the brightest and most dramatic portion of the Galaxy and an element of the night sky we love to incorporate in our work. If you happen to live in the Northern Hemisphere (above the equator), opportunities to find the core of the Milky Way are typically within the summer months. You can see the core during early mornings before sunrise in March until after sunset in October. Why early mornings in March and after sunset in October? Because the Milky Way is constantly moving around our night sky. Have a look at the images below and see how the core of the Galaxy moves in our area of the northern hemisphere throughout the year. 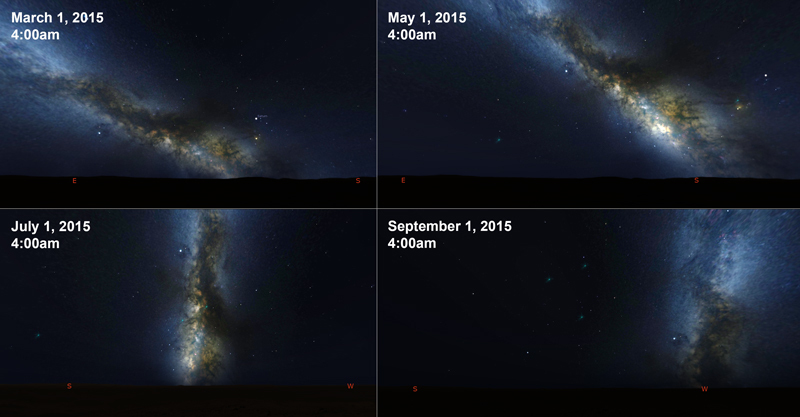 Core of the Milky Way shown at 4:00 AM different times throughout the year. See how the core transitions throughout the year? It is seen rising in the southeast, drifts to the south, and begins to set in the southwest. The images above are screenshots from a free astronomy program called ‘Stellarium.’ This program allows you to enter your location from anywhere in the world so you can see what the night sky looks like at whichever time you specify. We use this tool quite a bit to help plan the orientation for our images when I’m on my computer at home. Did we mention it’s free? If you need help learning the program, visit their user-guide HERE. The program is very easy to pick up and we highly recommend it for in-home use. 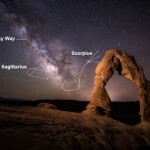 Scorpius, Sagittarius, and the Milky Way in Arches National Park. Lastly, what if you don’t have access to a mobile device with the apps listed above and want to find the Milky Way the old fashioned way? Fortunately, there are two constellations we commonly point out during our workshops that are very helpful. The first constellation is Scorpius. If observing the night sky in the Northern Hemisphere the head of Scorpius always rises before the core of the Milky Way. If you find this constellation already in the night sky, look to the left of it and you will find the core. 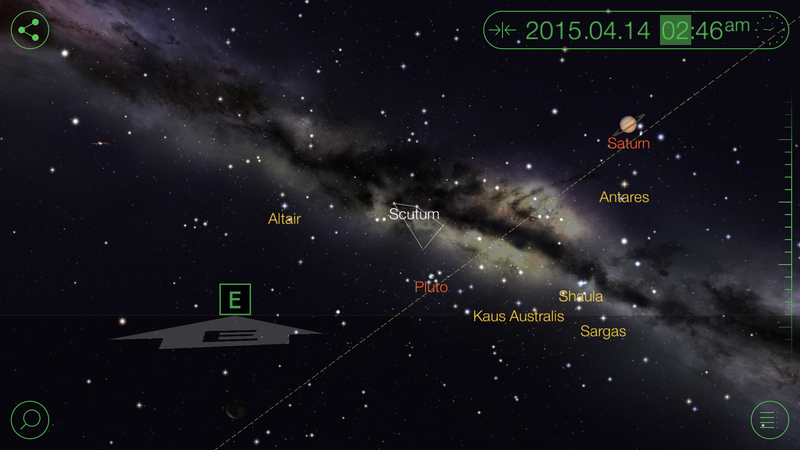 The second constellation we like to point out is Sagittarius. We call this constellation the ‘Teapot’ because of its shape and it looks like it’s pouring down towards the core of the Milky Way. 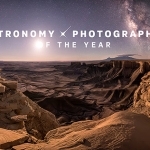 This is one of the introductory topics covered during our highly comprehensive Night Sky Photography Workshops. 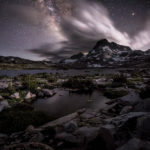 If you’re a beginner who has just picked up a camera or a professional interested in learning more about night photography, please check out our workshop schedule and read the testimonials from our students. Contents of this tutorial are for informational purposes only and are only meant to be used as a guide. Please use at your own discretion and enjoy! Great tutorial, Brad. Thanks for your unique insight and experience.